Since I wrote my interview, I have read a couple of books by Lolo Houbein, One Magic Square and Outside the Magic Square, which were sent to me by Wakefield Press. Lolo lives in Australia, but grew up in Holland during WWII and experienced the famine of 1944. On observing current events, she has become very worried that we are headed for a similar situation in Australia if we don't take food security more seriously. To me this is a fascinating perspective, Lolo wants us all to take responsibility for at least some of our food needs, and she believes that we can all grow something, starting with "one magic square". This is an excellent solution to the daunting task of starting a garden. Lolo tells you to just go out and dig up a square one metre by one metre, and when you feel confident growing in that square, you can start on the next. Brilliant! 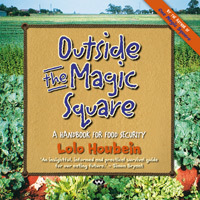 In her first book, Lolo suggests combinations of plants to be grown in a magic square. You can decide if you would prefer to grow staples such as potatoes and carrots, or high value crops such as eggplant and capsicum, or crops that don't store well such as silverbeet and salad greens. She shares all her gardening experience to tell you exactly what to plant, when to plant and how to fertilise (organically and cheaply, of course). If you want a step-by-step idiot's guide to starting a garden, this is it. If you follow Lolo's instructions, I'm quite sure that you will be on the way to producing your own food. 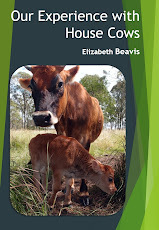 The second book goes into more detail about why we should grow our own, more about food security, GM food and global warming, as well as offering yet more magic square combinations. I enjoyed reading this book too, particularly the discussion on omega 3, which was totally new to me. I did find that it was a little light on references (even referring to "Today Tonight" at one stage! ), but I had to remind myself to take the book for what it is intended, its not an academic paper, its a discussion from a lady with decades of experience who would like to share thoughts on many issues. She probably doesn't have the opportunity to research these issues in depth, but she does spend time watching documentaries and listening to the radio in order to inform herself as much as possible. I found this book was like discussing these issues with a friend, and there are a few things I'd like to look up for myself to find out more. Most of all, I have absolute respect for Lolo's motivation, having experienced famine herself, she wants to save us all from a similar fate, and has done her best to provide us with everything we need to know in order to succeed. All that remains is to start digging those squares! 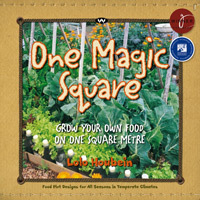 I have Outside the Magic Square at the moment from our local library, she is very inspirational, I am already growing some of our own vegies and fruit, this book and reading others blogs enforces the need to continue and encourage others to give it a go. I think the main thing that I learned from your series is to keep trying. I read one magic square a while back, and enjoyed it. I might check it out again and her next one as I often find something different when I read a book a second time. I really enjoyed your series Liz, a great idea to connect bloggers more! One Magic Square is my favourite gardening book, the one I refer to time and again, and the one I recommend to people just starting out. I've got the other one and am looking forward to getting into it. One Magic Square started my love of vegetable gardening. 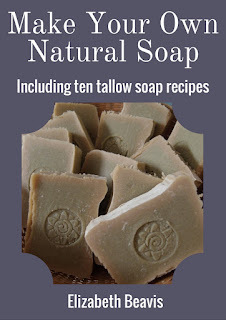 Thanks to your recommendation I have now ordered Outside The Magic Square and can't wait for it to arrive. I am starting to understand that gardening is a life long learning curve, a valuable life skill that too few have. I encourage my daughters to step out into our suburban food patch and gather a tomato and some peppers or cucumbers here and some basil or perpetual spinach there. Once the chickens arrive an egg or two with a few herbs and we have a meal.....from our tiny patch. I think it is just about getting people to believe they can do it,I even grew tomatoes on the window sill of the nurses home where I lived when I was doing my training. Thanks again for putting this series together :) It was lovely to be involved and interesting to read the different advice that others gave. Starting up gardening and growing food can be done in so many ways and though planning is essential it's really something that anyone can do. Good to hear that these books are already well-known, we need to keep spreading the word, growing your own is important and surprisingly easy! Wow seems like I am the last to hear of these books. I am slowly catching up on all your posts, and everyone else's too.